In partnership with the Winslow Arts Trust, Flagstaff Nuestras Raíces, and the Winslow Chamber of Commerce, Snowdrift Art Space presented Winslow’s Día de los Muertos (Day of the Dead) Celebration. The series of free programs took place along Historic Route 66/Second Street in downtown Winslow from Thursday, October 30, through Saturday, November 1, 2014. Families celebrate Día de los Muertos throughout Latin America and the Southwestern United States to remember their departed ancestors and loved ones, who are thought to briefly visit the earth at this time each year to make sure that all is well and that they have not been forgotten. On Thursday, October 30, Elena Díaz Björkquist presented Día de los Muertos: A Celebration of Life and Death at La Posada Hotel, exploring the holiday’s origins and traditional elements. Björkquist’s presentation was made possible in part by a grant from Arizona Humanities. On Saturday and Sunday, November 1 and 2, El Gran Art Garage presented the Dia de los Muertos Art Show featuring work by artists Wall Batterton, Laura Hipke, Dan Lutzick, Bruce Richards, Eddie Ruscha, John Scane, Scott Siedman, Rebecca Gray Smith and Sandra Yagi. 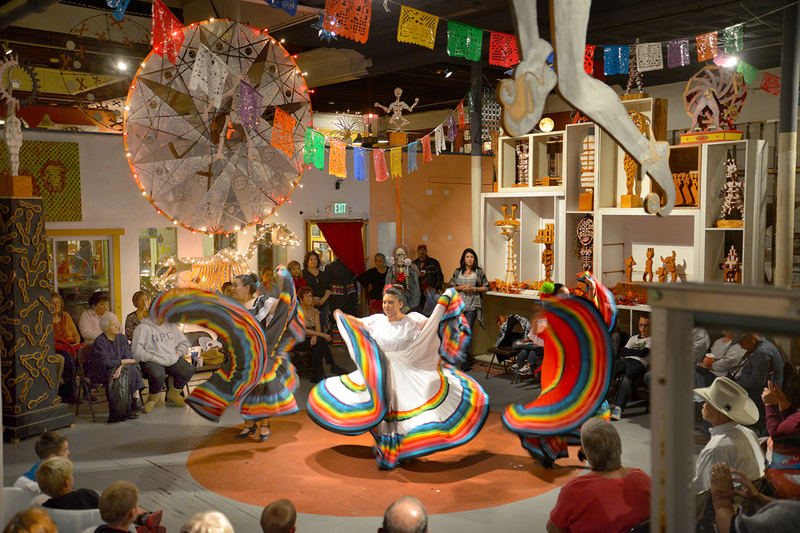 On Saturday, November 1, the Día de los Muertos Celebration took place from 1 to 9 pm at Snowdrift Art Space. Members of the public set up individuals altars or added their own ofrendas to Snowdrift’s Community Altar for departed family and friends. There were also Día de los Muertos crafts and event tee shirts for sale, as well as cake and refreshments for everyone. At 2 pm, Flagstaff Nuestras Raíces (“Our Roots”) hosted a Sugar Skull Workshop, and attendees also decorated skull masks throughout the day. Paper mache “sugar” skulls created for the event by Christa Knox’s Winslow Middle School students were also on display. At 7 pm, the Winslow Ballet Folklorico gave a wonderful performance to a packed house. Support for this event was provided by Snowdrift Art Space, the Winslow Arts Trust, the Winslow Chamber of Commerce, and Flagstaff Nuestras Raíces, which is dedicated to promoting Hispanic culture and history through events, gatherings, and the performing and visual arts. Snowdrift Art Space, the Old Trails Museum, and the Winslow Arts Trust presented the Snowdrift Art Space Centennial Celebration on Saturday, October 18, in downtown Winslow. One hundred people attended this free event, which celebrated a century in the life of one of Winslow’s most historic buildings. Snowdrift’s main gallery was open for viewing, the Coyote Boys dance group performed the Hopi Eagle Dance, and the Winslow Harvey Girls acted as hostesses for the event. The event also served as the Old Trails Museum’s Fall History Highlight, when it debuted its latest exhibit, Snowdrift Art Space: One Hundred Years of History. The exhibit, which is now on permanent display at Snowdrift, tells the story of the building’s evolution from the Babbitt Brothers’ largest branch store to its present-day incarnation as an art gallery and community event space. 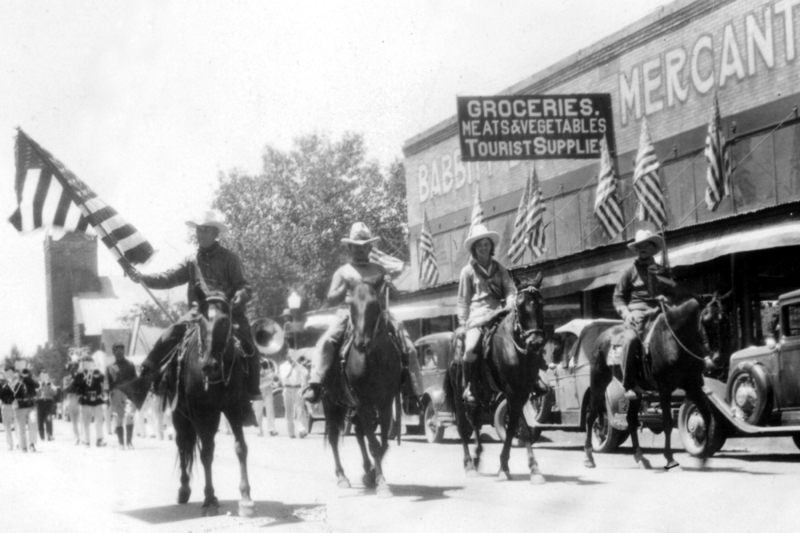 The Babbitts operated one of the most influential and respected corporations in Northern Arizona for over a century.